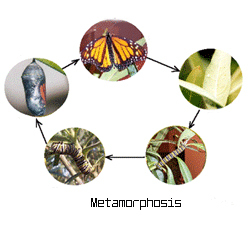 Metamorphosis is a biological process in which an animal physically develops after birth or hatching biological. This process involves changes in form or structure through cell growth and cell differentiation. This change can be said is a step by step that must pass before an animal is the perfect way. Metamorphosis is present in two forms, namely, the metamorphosis (hemimetabolisme) and the perfect metamorphosis (holometabolisme). Why is it called perfect and imperfect? It must be because there are distinguished two types of metamorphosis, is not it? Of course. Want to know why? Note the animal species of insects / insects around you. 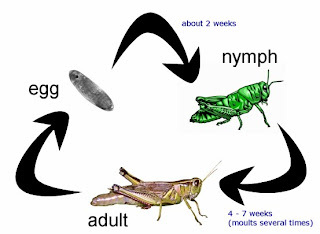 Dragonflies, crickets, grasshoppers, are insects which have incomplete metamorphosis, they become adult animals after change of form of nymphs. The development of the larvae are carried out several times during the phase of growth and ekdisis (change of skin). While the butterfly has an older stage before becoming adult butterflies. The first time, the butterflies will lay eggs. Butterfly egg usually will stick to the foliage. Eggs then become caterpillars. Therefore, the worms most often in the leaves, because the butterfly eggs that become the embryo of this worm was found in the leaves. Once the caterpillars become large and elongated, it will turn into pupae. In scientific language, we call it the pupa or chrysalis. Inside the pupa, digestive juices will be issued to destroy the larva's body, leaving only a few cells. The remaining cells will grow into adulthood, using the nutrients from the broken down larva. After a few moments, will come out of the cocoon of butterflies that are still young. Not long later into an adult butterfly.